Get Latest Update on Haryana D. Ed (JBT) Application Forms 2018 www.bseh.org.in JBT Exam Fee Notice - Haryana DEd course information Admission 2017-18 - D Ed information in Hindi - D Ed Online state council of educational research and training - Haryana Ded Admission - D Ed college in Haryana- Haryana DEd Date Sheet - Haryana JBT (D.ED) Admission 2017-18 - JBT Admission in Haryana D.Ed. Counselling Latest News. dated 25-08-2018, can Fill the remaining Online Application Form. Latest News (30.08.2018) - Haryana DEd Counseling Result/ Merit list has been released college wise. Haryana D.Ed admission 1st counselling result has been declared and the merit list is available college wise on official website. Click on the link given Above and select your college where the roll number wise or name wise merit list are available with cut off marks. The selected candidates can also download provisional admit card for D.Ed admission on official website. The provisional admit card can be downloaded by logging in your account and the candidate are required to report to the admitted college from 4th September to 7th September 2018. Don't forget to bring your all original documents along with a set of photocopy and application form with a valid ID proof at the time of reporting to the allotted college or admitted Institute. 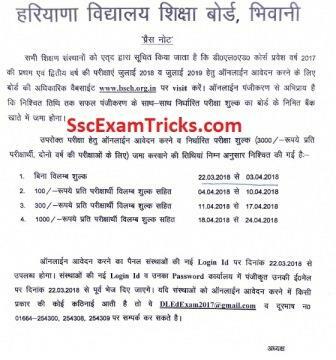 Latest news on 16th August 2018 Haryana JBT admission form has been available now. The last date to apply online application form for registration is 25th August 2018. Haryana school education board notice for 1st year and 2nd year of D.Ed. / JBT exam which has been scheduled to be held in July 2018 and July 2019. In this notice. said that the candidates are required to submit online application form or registration with with the following exam fees. Those candidates who are in D.Ed. 1st year and 2nd year in recognized Institute, can register themselves from the link given at the end of the page. Online registration for Haryana D.Ed 1st year and 2nd year application form will be available on 22nd March 2018 on new login ID of the institute. Haryana DEd Admission Allotment Letter Round V has been released now. The allotted candidates must bring two xerox copy of all original testimonial at the venue of examination. The reporting dates are 08th to 12th September 2017. The reporting time is 09:00am at the allotted college/ institute. Today, this is a reminder call to all those applicants who want to apply online for application form for JBT Admission in Haryana. The online link is provided here. · Visit official website http://scertharyana.gov.in/. · Click on link JBT admission 2018 press button. · Fill the all details and press submit button. Last Date for confirming admissions for Round 4 is extended till 01 Sept 2017.